So Delicious Chocolate Coconut Milk frozen dessert in a 500 ml tub. Hooray for sharing? As you scoop So Delicious Chocolate Coconut Milk frozen dessert out of the tub, it becomes apparent that it’s not a standard ice cream. Using an ice-cream scoop, it doesn’t want to curl around and stick together to form a pretty ball. It’s airy and flaky, for lack of a better word. In terms of taste, the stuff is, as the name suggests, delicious. It tastes like the two main flavours you’d expect it to taste like: chocolate and coconut. It’s not nearly as sweet as I was expecting — if you’re serving it with another dessert, the muted sweetness will be apparent. Consulting the short ingredients list, I learned they use organic agave syrup instead of sugar. Neat. Will it replace ice cream for the dairy true believers? Not likely. But it –can—readily replace ice cream for the whole table when you entertain a lactose-intolerant (or vegan) dinner guest. It’s different, but the flavours are familiar enough that even picky diners shouldn’t find it particularly alien. Cost: $5.99 for a 500 ml tub (on sale). Value for cash money: Not bad. Comparable to premium ice creams. Availability: Larger grocery stores, natural-food places. Nutrition? : 160 calories per 125 ml, along with 9 grams of fat. Of those 9 grams, 8 are saturated, which is 40 per cent of the daily value. (Eek.) There are 4 servings in the tub. So, if you have a Cathy moment and pig out, you’ll be ingesting 640 calories (and 36 grams of fat, of which 32 are saturated). Just so you know. Lots of iron, though. 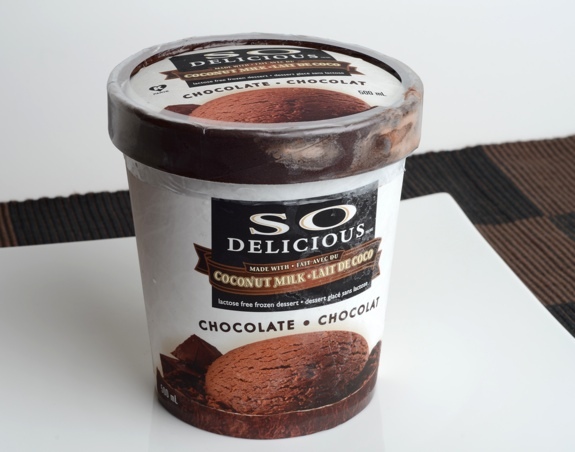 Pairs with: What’s a great way to serve up this vegan frozen chocolate treat? With a slice of vegan chocolate cake from Planet Organic. The verdict: Different, but very nice. 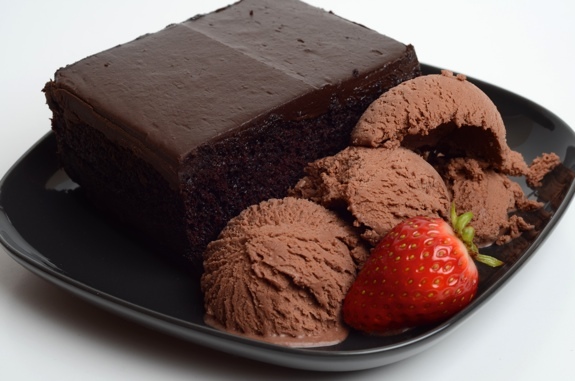 So Delicious Chocolate Coconut Milk frozen dessert, served up with a slice of Planet Organic's vegan chocolate cake. Mmmmmmm. I eat dairy, but I adore So Delicious coconut milk ice cream! It tastes like frozen chocolate mousse! Your cake and ice cream photo is spectacular. It’s making me drool. Yum! That looks great. I love that PO chocolate cake. I’ve looked at that ice cream but haven’t tried it yet. I’ll have to try it on a hot summer day since I can’t really get into ice cream until it’s at least +25 degrees. I know the feeling. But can you wait until +25 C to indulge? Maybe aim for a hot February day in Edmonton — say, +3 C. 🙂 Also, if you like the Planet Organic chocolate cake, I found a great recipe for vegan chocolate cake in one of the Moosewood cookbooks. I think it’s in Moosewood Restaurant Cooks at Home. To get the cake nice and fluffy, the recipe uses baking soda and white vinegar — just like in an elementary school science experiment — to get the batter to rise. hmmm, I’ve tried rice milk and soy milk based frozen desserts. Haven’t tried this one before but I have seen it in stores here. Will have to give it a try next time I’m craving some ice cream. Have you tried anything other then the chocolate flavour by them? Not as of yet. As Jill noted above, it’s been a bit too chilly outside for a wave of frozen-dessert testing. Some of the others look great, though. I’m eager to try the rest soon. Well, I haven’t had ice cream but I did have some of that cake last night. Love it! I’m going to wait for a bit for the ice cream though. Sounds yummy! I only buy the boring vanilla “So Delicious”, cause I want an ice-cream that will go with everything. But I’m definitely going to have to try the chocolate coconut. What a great sounding combination! I also like your pairing with the cake! We don’t have a Planet Organic, so I’ll have to find a good recipe and make my own. I think you have the Moosewood Cooks at Home book, no? The vegan chocolate cake recipe is amazing. I know what you mean about buying ice cream that pairs acceptably with almost everything. Vanilla may seem boring, but it works with most cakes, pies, and other random things. It’s the most versatile flavour. We don’t have that cookbook. Only “The New Moosewood Cookbook”. But we found it on the net and have it printed out already, so I’ll be trying it soon! Thanks for the tip!